It seems like only moments ago we saw that chequered flag drop in Sepang, and now we're gearing up for the next round - the Bahrain Grand Prix. The racing in the desert hasn't always provided us with stellar action-packed weekends, but if anything can change that, then the 2014 season can. We've got reliability-hit cars coming up against sand... everywhere, drivers who have had time in the cars on this track, and teams who are starting to get the hang of F1 2014-style. It should be a fascinating weekend regardless of what happens on track, so if you want to stay on top of what's going down, the logbook will be here to guide you every step of the way. Hello again, it's been... ooh, what about five minutes since we were last together discussing Formula One? Well, it's back to back races, so fresh from the heat of Malaysia, the paddock heads straight to the heat of the desert. As you'll know by now, this here logbook is here to keep you up to date with everything that occurs over the Bahrain weekend, with links and results and quotes and tweets and more. The best place to start, I always find, is with the handy Race information thread. This week, it includes rather spectacular moon imagery! That is, of course, because the Bahrain Grand Prix this year will be a night race. The later start time will see floodlighting all around the track, lower temperatures and a whole new set of problems for teams to worry about! However, let's not forget that they completed two weeks of testing during the pre-season running which means they will potentially be more prepared for this weekend than any other. Tweet from @McLarenF1 who are celebrating Jenson Button's 250th race this weekend: We’ve shared some of our top #Jenson250 races. Now it’s over to you. What are your favourite #Jenson250 moments? 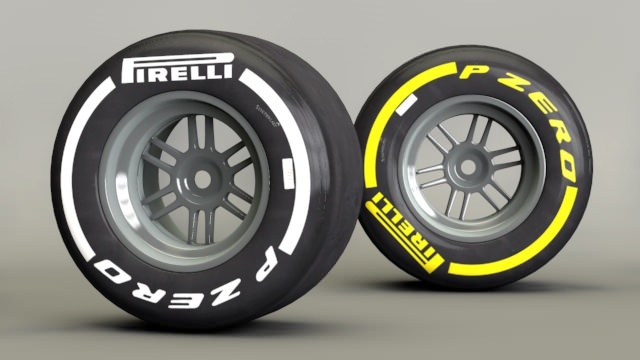 This weekend, the tyres available will be mediums (white sidewalls) and softs (yellow sidewalls). These are the same compounds that were available in Australia, and with the lower temperatures associated with an F1 race, you'd imagine the conditions might be quite similar to Melbourne too. This weekend will also see the first of the Friday drivers, with Robin Frijns set to make his debut for Caterham. The Dutch driver has ditched any other opportunities to concentrate on his third driver role at the backmarker team, so he'd better make the most of it! 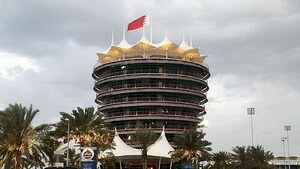 Here's a sight we're very familiar, the Bahrain International Circuit's landmark. It's Rob Smedley's first week at Williams, and the Brit will be in Bahrain to hit the ground running. Rod Nelson explained their relative job roles, saying: "I'll do the tests through the season and go to the races that precede those just to get up to speed with where the race team is with the car. We will have quite a bit of interplay between us through a race weekend as I'll be running the control room at Williams and he will run the pitwall." It looks like the weather in Bahrain is cool and windy, and perhaps slightly unexpected for those on the ground. What will the weekend be like? The Thursday press conference has been and gone, and Nico Hülkenberg has been talking about his on-track rivalry with Fernando Alonso: "I think Australia was not quite a battle. I was just driving in front of him and he overtook me by strategy. And in Malaysia there was not much I could offer in the end. I was struggling on my tyres; he was on a fresh set of softs. Still I was trying to make him work a little bit for the move." Read more from the press conference on F1.com. 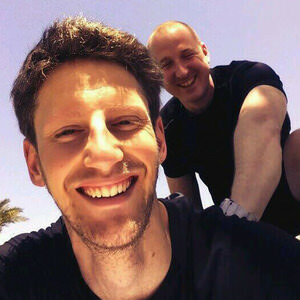 Tweet from @MarcCox: First pit stop practice of the week done, I'm now going head back to the hotel and have a pizza! Both the Williams and McLaren teams will be running modified paint scheme's during this weekend's track sessions. McLaren have been seen sporting different logos on their cars at each race this season, and will run with Gulf Air branding on the side of the MP4-29 in Bahrain. Gulf Air is both the national airline and principle sponsor of this weekend's race. Williams meanwhile have had to modify their Martini emblems, which will simply read "Racing" for the duration of the upcoming event in order to comply with local alcohol legislation. It's Free Practice Friday and if you're watching any of the action, you might find the live thread useful. Who will suffer reliability troubles today? It was a Mercedes day again, as two practice sessions spun by in a flash. The same three drivers topped the time sheets in both sessions, with the afternoon about three seconds faster than the morning. If you want full results of the free practice sessions, then look no further. They do look quite similar, but first practice has some new names in there, whilst second practice is just that little bit quicker. The topic of driver health has been at the front of people's minds this weekend, we discuss all sides of the argument in the latest F1 Debrief. During the Friday press conference, Williams' chief technical officer Pat Symonds was asked for his views on this year's engine regulations. "I think as a business we ought to focus on the positives and I think that the technology that we’re employing in Formula One now is impressive. The road car industry has to hit CO2 per kilometre targets and those are very difficult targets to meet. And they will have to employ technologies such as we are using in Formula 1. So we are moving things forward, we are more relevant than we used to be and I think that’s very important. "I think there was a great danger that we would become irrelevant. We would become the focus of gas-guzzling and not having social responsibility. And I think it was really important that we did move away from that"
Asked by the BBC for his take on the new F1 engine regulations, Red Bull's chief technical officer Adrian Newey was less convinced by the need for change. "I like lightweight and efficiency, and these regulations have created cars that are exceptionally complicated, quite a lot heavier. Complication and weight is an expense, if it brings something that's absolutely fantastic, but I do believe that should be debated. "Trade the cost of the power-unit versus the cost of making the car lighter or more aerodynamic or whatever. So I think it's questionable." @GvanderGarde: Everything starts late here in Bahrain so we can chill a bit and do a cardio session before going to the track! The FIA has informed drivers that modifications will be made to turn four after both Kimi Räikkönen and Pastor Maldonado suffered high speed incidents during practice that damaged their respective chassis. 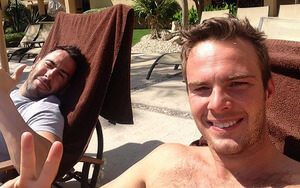 Mercedes' Nico Rosberg was given his first official reprimand of the season, following a clumsy move that saw him weave in front of Sergio Pérez during free practice. Stewards determined that Rosberg slowed unnecessarily and recklessly in front of Pérez between turns 13 and 14. McLaren protégé Stoffel Vandoorne has won the opening GP2 feature race of the season. Spotted observing the podium celebration were none other than Éric Boullier and Ron Dennis. Expect Vandoorne to step up to F1 in no time at all. The official F1 timing app is providing additional video analysis for the first time this year. Gary Anderson spent the second free practice session comparing the various entry and exit lines taken by the field into turn 10. He concluded that Ferrari could be in contention for a front row start today, while Red Bull have one of the most drivable chassis out there (despite their well documented troubles on the power front). The final free practice session of the weekend gets underway shortly. Be certain to join in the conversation on Sidepodcast if you are watching. Sebastian Vettel had a moment during free practice, spinning off and stalling the car. His session ended early. In a rare moment of unreliability, the world television feed went down during free practice. Visual normality was restored with just ten minutes of the session remaining. Little changed in third practice, although Pérez delivered on Force India's bullish optimism by slotting his VJM07 into third place. Bahrain GP organisers have stated that future F1 events at this venue will also be night races. 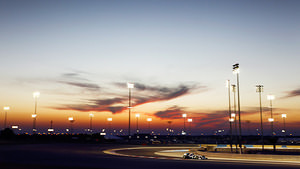 After witnessing ticket sales increase on the back of the revised late start time and having invested in the infrastructure required to light the circuit, circuit chairman Zayed Al Zayani has said there are no downsides to running the event at 18:00 local time. Full results for the third and final practice session in the desert are now available. Qualifying discussion already underway in the live comments. Feel free to partake in predictions and debate ahead of the third qualifying of the year. Nico Rosberg scored his first pole position of the season in Bahrain, relive all the highlights with Sidepodcast's live text coverage of the afternoon's action. If you want the full results of qualifying, then head here. You can see just how well Williams did, and ponder what happened to Sebastian Vettel. If you're short on time, enjoy this 60 second summary of qualifying's key moments. FIA president Jean Todt has made an appearance in the paddock today. Here's catching up with Mercedes' Niki Lauda, but will also no doubt be keen to speak with the defending world champion Sebastian Vettel about the disparaging comments he made recently concerning the sound of Formula One's new engines. Claire Williams talking to the BBC about the progress her team have made since 2013. "We have a team that is performing to the best of their capabilities. It is important to recognise the step up from finishing last year's championship in ninth to fighting for top positions this year. It's all about the development war now, and making sure we capitalise on where the car performance is at the moment." Race stewards have given Sauber's Adrian Sutil a five place grid drop for tomorrow's race after reviewing an incident between Sutil and Romain Grosjean during qualifying today. Sutil also receives two penalty points on his super licence for a period of 12 months. Toto Wolff has spoken out about what he calls absurd suggestions that Formula 1 needs to rethink some of the rules introduced this season. The Mercedes director isn't happy that some teams, including Ferrari, seem so keen to criticise the sport. "We are eight tenths off pole from last year with a car that is 25% down on downforce, with much harder tires, with 30% less fuel consumption, is heavier, with more power and more torque and greater straightline speed. "We are in a brilliant technical revolution and we are talking the sport down. All the cars were flat out. We finished with some margin on fuel. There is no holding back. There is no fuel-saving mode." Some insight into Sauber's performance troubles thanks to Sky Sports Ted Kravitz. 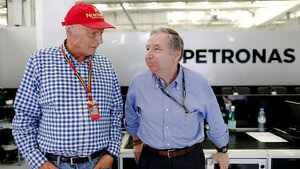 He reports team principal Monisha Kaltenborn said "We are nowhere, but the good thing is we know why we are nowhere." She went on to explain that the base of the car is essentially good, but there is a weight issue, brake-by-wire issues, a specific aerodynamic issue and more to come from the power unit. Fans can expect a significant improvement from the team by the Spanish Grand Prix in May. Tweet from @joesaward: Bernie Ecclestone just visited the press room to tell the media that all teams bar except Mercedes want to change. No sign of Jean Todt. Bernie Ecclestone has announced two new teams will be given entries to compete from 2015 or 2016. One of the teams will be a US entry, run by Gene Haas. Here's how the grid will line up this afternoon. The mid-field is where it is at in Bahrain. For all your pre-race discussion, we have a live commenting thread. Lewis Hamilton won the Bahrain Grand Prix ahead of his teammate by just one second. If you missed any of the dramatic racing action, be certain to look back through the lap-by-lap event highlights. Full race results have been published, along with updated driver standings and constructor standings, following the third round of the F1 world championship. During today's race, stewards awarded Pastor Maldonado a ten second stop and go penalty for the collision with Gutiérrez. Maldonado will also receive a drop of five grid positions for the next race, plus the Lotus driver collects three penalty points on his super licence. The Sauber team report that Esteban Gutiérrez has completed all medical checks and has been released from the hospital, following his inverted view of the Bahrain International Circuit. You would struggle to find a happier group of people this evening than the Force India team following their hard won third place finsh. Team Principal Vijay Mallya, was on hand to enjoy the occasion calling it "one of the greatest days in the history of our team." Two positives from this weekend that have been largely overlooked. The near perfect tyres that Pirelli brought to the circuit, which seem to be able to deal with a sensible amount of wheel locking, whilst also still losing grip when overworked or during a long stint. Seemingly a near perfect combination of compound attributes. The other notable addition to the close racing action was the FIA specified DRS zones. Identical in location to last year's race, they allowed drivers to stay in touch with rivals, whilst still making them work hard to complete a pass. The closing laps between the leading Mercedes pair offered a great example of these factors working to enhance the show. Attention will now turn to the upcoming two day test which begins in Bahrain on Tuesday. Renault have by far the most work to do and head of track operations Rémi Taffin is well aware of the challenge the engine manufacturer faces. "We still have some way to go, we are on the tail end of the group. This just gives more motivation for the coming days, starting with the test next week where we have a hefty job list over all four teams. "We may well be on the back foot in China, which has a long straight similar to this one, but the updates we will test next week should see the Renault­ powered cars a lot closer to the front in the races thereafter." We are almost at the point where we say goodbye, but there's just time to wrap up the race in sixty seconds, well, try to anyway. That's all for now, what a fab race weekend it has been! There's testing going on in Bahrain this week, so keep your eyes peeled for more F1 news. Then, let's meet back here in a week and a bit, just in time for the Chinese event to begin.